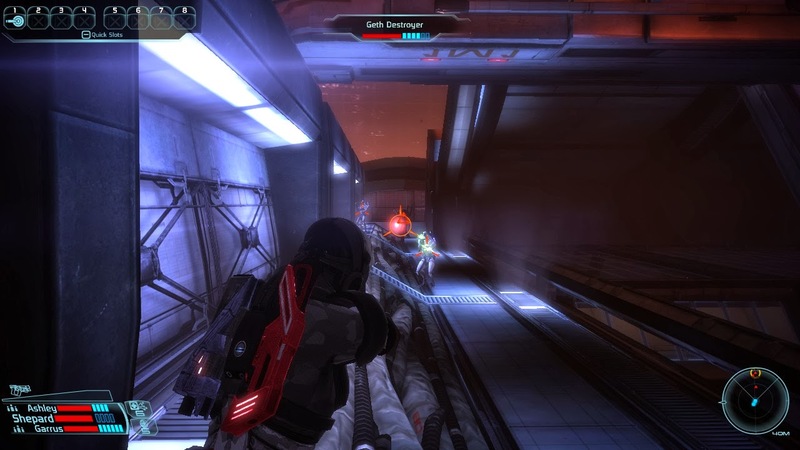 Mass Effect is a game that took me a very long time to get into. When I first started the game, I found it to be wildly overrated. The game felt slow and a bit tedious. I've since come to realize that most, if not all, of the problems that I found in the game were related to the technical limitations of the old laptop that I was playing the game on. As it turns out, when a game doesn't run well, it can be quite difficult to become immersed. Who knew? Once I transferred my old save file to my new computer, the game suddenly became a wondrous space adventure. I was quite hooked. 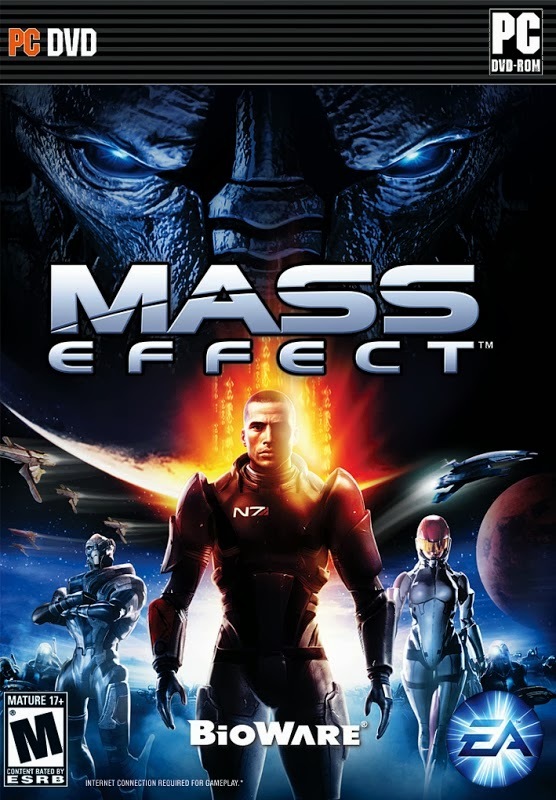 Within about a month and a half, I had not only finished Mass Effect, but I'd played through the Mass Effect 2 and Mass Effect 3 as well (I'll get to those later). Though there is definitely some excellent gameplay in the Mass Effect games, I think that primary draw of the series is it's narrative. This is especially true for the first game, where a few of the mechanics are not always so enjoyable. It's as if BioWare started with Knights of the Old Republic as a blueprint, and started iterating on the feature set of that game (read my way-back thoughts on that game here). In KotOR, the major systems worked really well: the battle system, the conversations, and the inventory. It certainly makes sense that they would want to improve upon what made that game great in order to make a game that would be even better, but I'm not so sure that they were successful in every regard. In an effort to modernize some of the strengths of KotOR for use in Mass Effect, the battle system seems to be just a little underdeveloped. It's not terrible, but it's not great either. And I don't even want to talk about the inventory in that game. Ugh... talk about being obtuse! 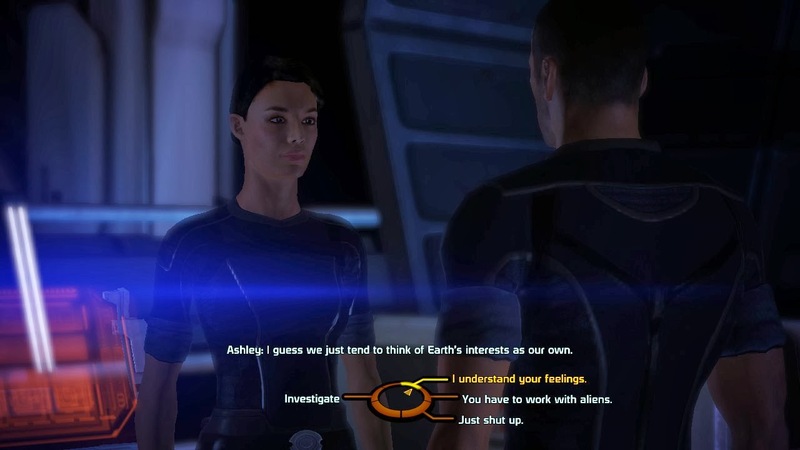 But as minor as these complaints are for me—and they are minor—I have to applaud the steps forward that they took with the dialogue system in Mass Effect. BioWare iterated on the classic mechanic that already worked really well in their previous games and paired their new "dialogue wheel" with some stellar voice acting, producing a mechanic that has raised the bar for storytelling in a video game. It somehow manages to feel both interactive and believable. This cinema-quality storytelling is what thoroughly hooked me into the game (once I had a computer capable of keeping up with the game). 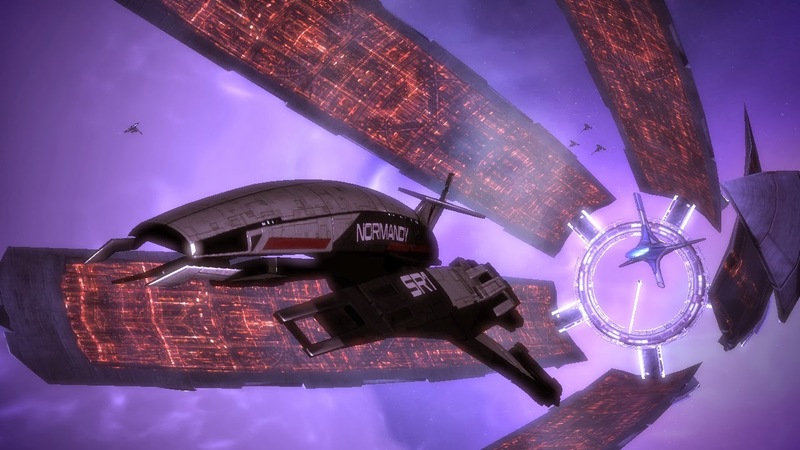 I think that the narrative quality of Mass Effect makes it worth the investment of time in spite of some of the game's less polished parts... unless, of course, you have no interest in epic interplanetary space adventures in which you fight a seemingly indefatigable enemy to temporarily save the galaxy from certain annihilation. And if for some reason you count yourself among the disinterested, you should probably just go play Dragon Age: Origins or something. Actually, perhaps I should go replay that game now that I have a computer that can actually run the game without major graphical glitches.